Contrary to popular perceptions, Aztecs before the advent of the Spaniards had developed sophisticated technology in various domains. Although their defence and communication technology was not on par with the Spaniards, they had advanced quite well in other areas. Some of the salient accomplishments of Aztec technology include independent development of mathematics, development of a specialised Aztec calendar, invention of the canoe, and various helpful forms of medicine. Due to the absence of iron and bronze, their defence technology was not as advanced as the Spanish conquistadors. Aztec technology used for making weapons mainly relied on the use of stone and copper. Aztec technology used for making weapons mainly relied on the use of stone and copper. This was because Aztecs did not have access to iron and bronze. Before the use of copper for making weapons, they mainly relied on obsidian and chert. In certain other areas, Aztec technology for weapons was quite sophisticated. For instance, they made drills which were made of reed or bone. One of the innovative weapons used by the Aztecs was called macuahuitl which was a wooden club having sharp pieces of volcanic glass. It was used to disable an enemy soldier without killing him. Aztec Technology – The Aztecs could not build roads due to the swamp landscape so relied on a network of canals. Aztecs faced two crucial disadvantages in terms of Aztec technology for transportation: the absence of wheels and horses. On the land, travelling by foot was the most common way of transportation which naturally was very slow. Due to this reason, the Aztecs did not construct any roads. However, Aztecs has developed special boats called canoes which made transportation through streams and rivers easier. This mode of transportation was thus extensively used throughout the Aztec Empire. They dug many small canals for the transportation of canoes. Aztecs made several important advancements in the domains of education and science. They were among the first societies in the world to make education compulsory for all children. This education also included basic military training for all male students. In the field of science, they made advancements in mathematics, medicine, and astronomy. Steam baths and a variety of herbs were used as medicine. In mathematics, they had their own number system which used 20 as its base. Among various other purposes, this numbering system was used for calculating taxes. One of the most remarkable achievements of Aztec technology was in the domain of architecture and building of various structures. Some of their enduring feats include the chinampa system of farming, stone carving, and the remarkable step pyramids. Proper care was taken about proportions and structure of these pyramids which served as the temples. 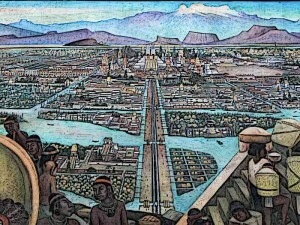 Another example of Aztec technology in the domain of architecture was the city of Tenochtitlan which was divided into four parts each having its own architectural value. The Aztecs also built two large aqueducts which fulfilled the need of fresh water for bathing in the city of Tenochtitlan. Aztecs made a variety of weapons and tools even though they did not have access to iron or copper. Instead, they made use of andesite which was a form of volcanic rock other than obsidian and later on, bronze. Obsidian was a strong and brittle volcanic glass and had central importance in Aztec technology for tools and weapons. Various kinds of tools and instruments made using these materials included the digging stick called “uictli”, fire kindling sticks, copper axes, a wooden club containing sharp pieces of obsidian called macuahuitl, and others. 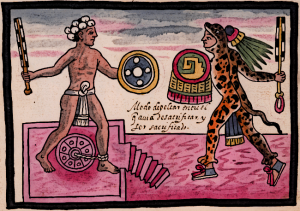 In the development of calendars, Aztec technology was once again at its finest. In the development of calendars, Aztec technology was once again at its finest. The Aztecs made use of two calendars one of which was exclusively reserved for tracking of religious ceremonies and festivals. This calendar was called tonalpohualli or “day count” and had 260 days. 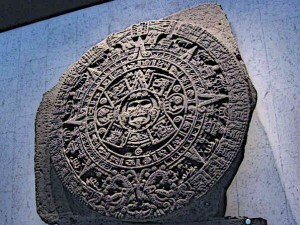 The other calendar was using for tracking of time and was called Xiuhpohualli or “solar year”. This one had 365 days having 18 months of 20 days each. Both calendars coincided after each 52 years. In the domain of medicine and healthcare, the Aztec technology was no less impressive for their own time. To prevent muscle spasms and relax the muscles, they invented a special kind of antispasmodic medicine using various herbs which was very effective. In particular, the Passion Flower was used for this purpose. It also helped for insomnia, epilepsy, and high blood pressure. Aztecs also extensively used steam baths and believed that sweating made the poisons leave the body of the sick person. Very innovative Aztec technology was used for farming and agriculture. The most important aspect of Aztec technology for agriculture was the farming method called “chinampa” in which the land was divided into rectangular areas and farmed through canals. This was an artificial island built on the swampy ground. Various metal tools and instruments were also made to be used in agriculture and farming. This included a wooden digging stick with metal end known as uictli. The Aztecs had certain technological disadvantages against the Spanish invaders including the absence of iron, bronze, horse, and wheel. Despite these crucial disadvantages, Aztec technology had made impressive advances in various other respects. For instance, they had developed innovative methods for farming where the artificially made farming land over the swampy lake beds was used for farming. According to some observers of the time, the methods used by the Aztecs in their medicine were, in certain aspects, even better than the methods used by the Europeans at the same time. Aztec technology made impressive advancements in various spheres of life such as mathematics, astronomy, medicine, education, agriculture, and the making of tools. They were among the very first societies in the world to introduce compulsory education for all the children. In the domain of farming, they invented new farming methods to overcome the problem of swampy land, in addition to making various useful tools. In astronomy, they used two calendars, one for keeping track of religious ceremonies and another one for measuring time. The Aztecs had their own number system using 20 as base which they used in the calculation of tax and tribute. Since they did not have horses and wheels, they used canoes as the primary medium of transport and dug up many canals for that purpose.